Fish dying in pitch-black, debris-filled waters, lack of drinking water and of electricity, are only a couple of the many problems the inhabitants of Makoko have learned to deal with. Their biggest fear is that they are going to be evacuated by the government and real estate moguls who will seize any opportunity to turn their floating slum in a luxurious residential area. Makoko is a 200-year-old fishing village built on the water bank of Lagos Lagoon in Nigeria. Lagos has recently become one of Nigeria’s economic centers and Africa’s largest city (20 million inhabitants). Makoko and its life “on” water, an inch away from the skyscrapers that keep cropping up in Ykoki (business center), has remained untouched by the economic boom around it. 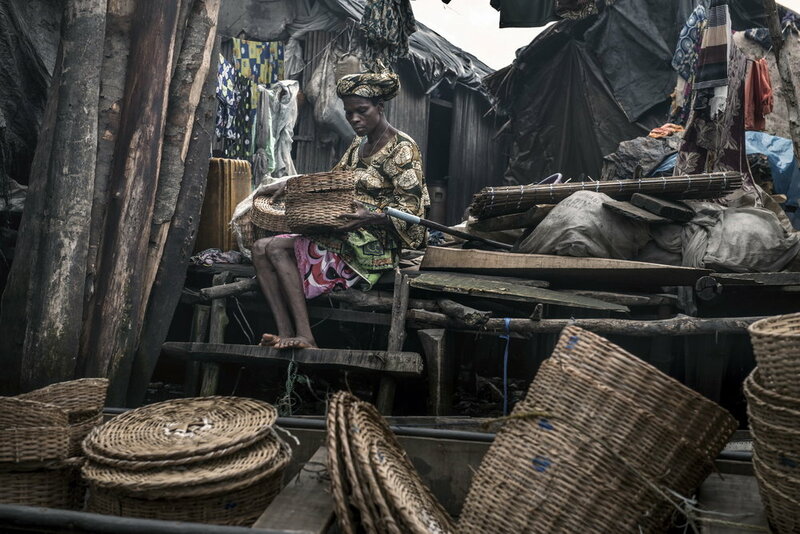 Makoko has a population of about 100 000, mostly fishermen from Benin and Togo. The Nigerian government refuses to officially recognize the legitimacy of Makoko and will not provide any public services. There is no running water, electricity, sewage system, public schools or hospitals. Consequently, Makoko has created a parallel system in order to survive and manage itself. Baale, five local leaders, assisted by vigilante (volunteer policemen that are part of the population) make decisions and ensure security locally. There are a few private schools and health clinics, traditional quacks, restaurants, hair salons, barber shops, churches, kindergardens, photo studios, tailor shops, electronic repair shops. Ironically, drinking water represents the greatest shortage of this water dwelling – it is extracted via driling and sold for household needs. The cobweb of sewers is full of refuse and human waste. There’s also a high shortage of fish. Nowadays, merchants’ food stalls and boats are full of frozen mackerel imported from Holland, which people then bloat in order for it to resist the heat. The lack of sewers and drinking water set the population’s health at risk. But all of this is mere trifle to the locals, compared to the fear of being evaicted overnight by the government. The water below them is worth billions. Makoko is located in an area of Lagos that presents great interest for real estate businesses; it could be filled with sand, turned into land and sold to the wealthy. This is how Banana Island came into existence. It is situated on the opposite side of the lagoon, a kilometre away from Makoko, where fishermen claim the best fish is. According to Forbes.Com, a 3-room apartment costs 2 millions dollars and the land for a house between 4 and 6 million dollars. After similar cases in 2005, 2010 and 2012, in an attempt to evict and clean Makoko up, police troops armed as if for war asked the entire population to leave the area in 72 hours. Many houses were destroyed and then burnt to the ground, and thousands of people were left homeless. Many of them still live there, their boat being their bed and roof. The locals have reacted, trying to stop the demolition. One of the leaders was shot dead and other people were wounded. The locals’ determination to face the armed police and the pressure of the NGOs has made authorities bring the demolition to a halt. At least for now. The future of Makoko is yet to be decided. There are different initiative of regenerating the area. Influential businessmen want the area to become a second Dubai, a grandious project named Eko-Atlantic. NLE, a group of Nigerian architects, has drafted and carried out a schoo prototype that could be implemented in the entire region. The project received international praise, being nominated, among other things, for an award given by the London Design Museum. Authorities have remained unimpressed and insist on reiterating that an illegal construction, without authorization to function as a school, is up for grabs.